How do you find this 500 peso bill? I don't like the person (former President Ferdinand E. Marcos) but I like the design and the colors of this paper bill. I wish I could have just one copy of this to add to my collection. Too bad for Marcos, it was changed into the yellow 500 peso bill of the late Senator Benigno "Ninoy" Aquino, the husband of the late President Corazon "Cory" Aquino. 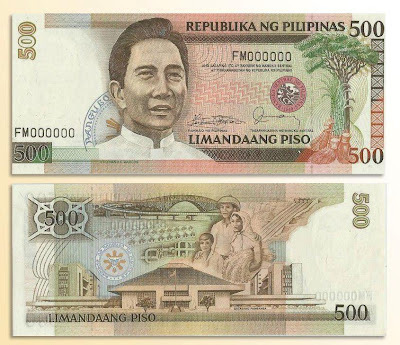 Mr. Romeo MananQuil, the banknote’s designer himself, noted in his site that in the late 1985, his 500-peso Marcos bill was slated for production. However, when a snap election was scheduled, the circulation of the newly printed bills was put on hold in deference to the law against electioneering as Marcos.